Pour the yogurt in a medium-sized bowl and add the fruits, walnuts and chia seeds. Serve and enjoy! Personalize this recipe with your favorite fruits. Breakfast is undoubtedly the most important meal of the day. In general, when we skip breakfast, we're all the hungrier when lunch rolls around, and get the munchies later on in the day. Breakfast is simply irreplaceable. 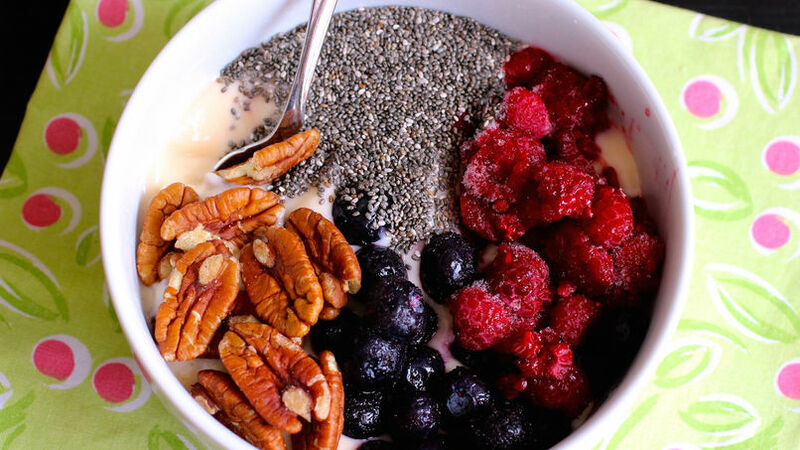 Today I share with you a yogurt recipe that combines chia seeds, berries and walnuts. If you want, you can add any other ingredient to this power bowl such as seasonal fruits, dried fruit, nuts and honey. May my recipe inspire you and serve as a springboard for your own yogurt bowl creations! Let's eat breakfast like champions!